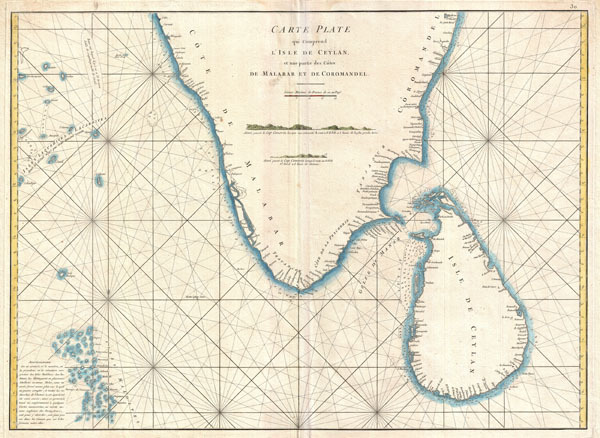 18th century French nautical chart of the Ceylon or Sri Lanka. Carte Plate qui Comprend L'Isle de Ceylan, et une partie des Cotes de Malabar et de Cormandel. An extremely attractive large format 1775 maritime map or nautical chart of southern India and Ceylon by Jean-Baptiste d'Après de Mannevillette. This chart covers the southern tip of India including the Malabar and Coromandel coasts as well as the Island of Ceylon ( Sri Lanka ) and the Maldives. Extends northwards as far as Cabo and Madras and eastwards as far as the Maldives and Laccadive Islands. Inland detail in minimalist but marine detail is excellent with well-defined coastlines, many rhumb lines, numerous harbors and ports noted, and countless depth soundings. The chart includes two shore profiles focusing on Cape Comorin. Mannevillette's chart marks a considerable advancement over previous nautical maps of this region. Engraved by De La Haye for Jean-Baptiste d'Après de Mannevillette's 1775 Neptune Oriental. Mannevillette, D'Apres de, Le Neptune Oriental, 1775. Very good. Original centerfold. Blank on verso. Platemark visible. Wide margins. National Library of Australia, MAP Ra 49 Plate 30.